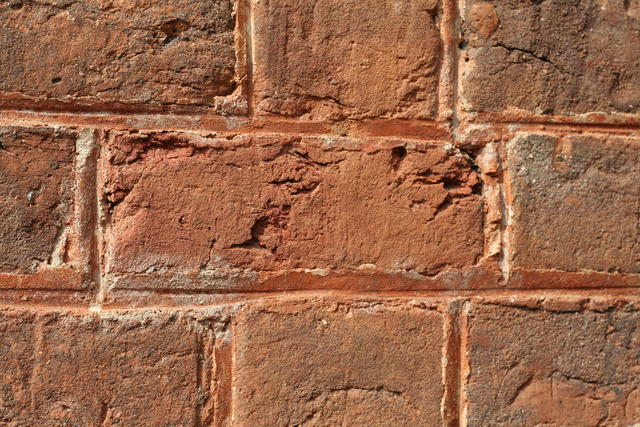 As the stucco was being removed from Montpelier, small patches of a curious red coating were found over much of Montpelier’s exterior brickwork. Analysis by paint conservator Dr. Susan Buck confirmed that the coating was a red wash (a lime or hide glue based paint that was commonly applied to brick buildings in the 17th, 18th, and 19th centuries). Because painting the exterior of the Mansion with deep red paint would be a radical change, the Restoration Team needed to know when the wash had been applied as well as how often it had been renewed. Without answers to these questions, the Team would not be able to postively say that the paint was a Madison-era coating and so would not be able to justify applying a reproduction red wash to the Mansion. A surviving sample of red wash found on Montpelier's North Elevation.